February 2016 issue of Stamp Magazine, UK. Philately is fraught with peril for the innocent and enthusiastic schoolboy collecting Malaya Japanese occupation, as I found out not too long ago. One afternoon in the autumn of 2015, I took out my album as usual to admire the beautiful Kanji overprints arduously built up from post-bids and dealer transactions over the last two decades of my youth. But this time it looked different. I began seeing a few weird-looking stamps here and there, and suddenly realized with a pang of dismay that their overprints were fake. I had finally arrived at a critical threshold of numbers of Japanese occupation stamps seen, a large-enough number that the fake ones now flashed themselves like lights on a Christmas tree. But the dismay quickly gave way to a child-like fascination with the smorgasbord of colour and pattern laid out before me. I said to myself, by golly, this is really interesting. Some forgeries are more 'legit' to collect than others. In the former category are postal forgeries produced to fool postal authorities during the period of validity. Postal forgeries include those created by governments and postal services, either to test their own anti-fraud measures or in times of conflict to serve as propaganda or to erode the enemy's revenue. Far less 'legit' are the philatelic forgeries produced to fool stamp collectors, and they are the subject of the present discourse. 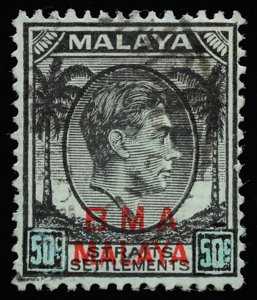 Postal forgery: the well-known BMA MALAYA 50 cents, produced from the 1 cent black by dyeing the paper green and altering the face values by hand. Philatelic forgeries are often easier to find and cheaper to buy than the real rarities that have inspired their advent, unless one is eyeing the legendary fakes of Jean de Sperati. The real ones may turn up in an auction once every half a century, command an astronomical investment-grade premium, and be locked up in a vault to appreciate in value for most of the next half-century, with limited benefit to humanity. Simon Garfield (2008) warns of depression and financial ruin for those who get hooked on rarities. Furthermore, the prospect of waiting years for something that will most probably never become available and affordable finds little appeal among today's generation, whose protagonists live on highly discounted time (to borrow economics jargonology). In other words, we tend to be far more focused on gratification in the near future than in the long term. It is not altogether a bad thing: what if I die tomorrow? If I really want to do something, maybe I should do it now. 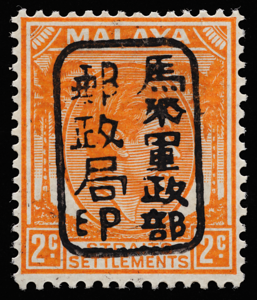 Philatelic forgeries of various Japanese occupation overprints on Malaya. These range from crude rubber stamps (not shown) to digital prints (far left) to sophisticated typographed impressions that look very close to the real thing (far right). 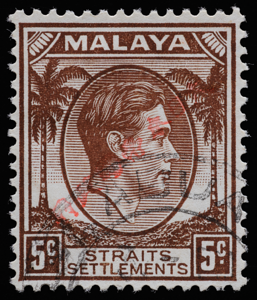 Many forgeries of Malaya Japanese occupation overprints are good enough to be proxies for illustrating the macroscopic traits and the beauty of the real thing. You could tell the story of the stamp just as effectively as if you were using a genuine specimen, and even better, there is the bonus of a nice story about the process of forgery itself. They are more than simply a poor substitute for the real thing, unless one is counting on them to fund one's retirement (which I admit is a very big caveat for many). It hardly needs to be said that a forgery should always be clearly marked as such. The philatelist has an even higher moral duty than the man on the street to not knowingly pass it off as the real thing. The motive for collecting forgeries must remain honest and ethical. And it need not preclude collecting the genuine item; forgeries will provide educational fun and satisfy the craving to collect while awaiting the real thing, even if the real thing never materializes. To forge is to imitate something with the intention to deceive whether for profit or otherwise. It is a universal phenomenon of human nature that goes back to antiquity, in places as disparate as ancient China and ancient Greece and Rome and involving coins and works of art (Craddock 2009). Even nature indulges in forgery. Mimicry of toxic warning patterns by harmless creatures to discourage predators is well known. There are even crazier forgeries in the animal world that allude to a human's conscious attempt to deceive. 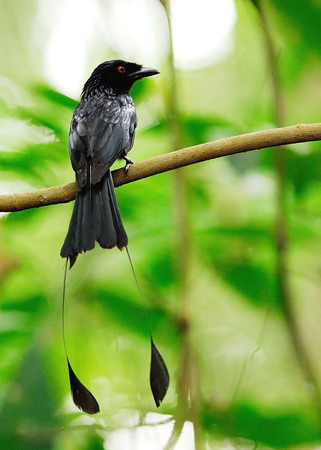 For example, the Greater Racket-tailed Drongo of Asia has no qualms about faking the calls of other species of birds. Who knows whether it is plain mischief or a tactic to gain acceptance in the multispecies foraging groups of which it is a regular patron. Master sound forger: the Greater Racket-tailed Drongo Dicrurus paradiseus. As civilization advanced towards modernity, money and everything else from handbags, Stradivaris, documents and medicines came to be forged. Even fake guide dogs have made the rounds. The art forgery industry is probably at the forefront with regard to financial turnover, having conned art collectors and famous museums out of millions of dollars. The philatelic forgery industry, in comparison, is minuscule, being more akin to the informal economies or grey markets that dominate developing countries. It is big enough, however, that it cannot be ignored. It is well known that sophisticated philatelic forgeries have escaped detection by reputable dealers and premier auction houses; the author has personally encountered several examples in the case of Japanese occupation overprints. It is true that no dealer can economically examine every stamp in detail, but the fact remains that forgeries continue to slip through the nets at a high rate. Despite the decree of forgery as a criminal offence in many countries, stamp collectors around the world continue to be ripped off while forgers suffer little or no legal or financial consequences. Indeed, some crude forgeries have managed to deceive the philatelic community for almost a century (Cohn 2004). As long as stamp collecting exists as a hobby, there will always be forgers targeting enthusiastic novices who do not have the privilege of experience. Nor would it necessarily occur to novice collectors that more experienced opinion might be needed on a Malaya Japanese occupation overprint. Even experienced philatelists studying postal history are increasingly falling prey to bogus covers as forgers broaden their scope to the entire postal envelope in order to capture a greater share of the market. Many philatelists simply avoid or advise against collecting Japanese occupation because of rampant forgery. Unfortunately, it is the astonishing diversity and history of these stamps that has bred those forgeries, that we would deprive ourselves of by shunning the mess altogether. How do we begin to address this? We need someone to collect and study the forgeries, and make the analyses easily accessible, so that the entire community benefits from the knowledge gained and can collect risky and exciting areas with greater confidence. The American Philatelic Society already has a major reference collection of forged material (Bristow 2000). The philatelic community at large, however, has traditionally been reluctant to take this matter out into the open. 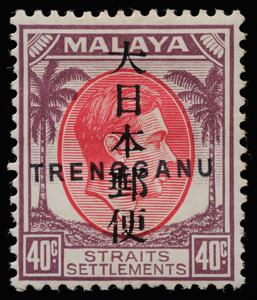 In the quest to deter forgers, philatelists have gone as far as to publish illustrations of Japanese occupation overprints that have been altered so that their details differ from the real overprints, with a note saying that if an overprint looks identical in every respect to the illustration, then it is a forgery. It is the author's proposition that this will confuse collectors trying to identify the real thing, while forgers simply extract the real overprint from low-value stamps that are readily available. Only with transparency of information would budding philatelists become more streetwise and capable of finding their own footing in today's competitive and treacherous stamp markets. Furthermore, it encourages philately to extend its reach beyond postal history and stamp issues to encompass such diverse disciplines as social science, economics, forensic science, law, psychology and printing. The study of a forgery can bring about an even better understanding of the real thing. Having real and fake alongside each other for comparison can make a collection more interesting in the same way that (prohibitively expensive) essays and die proofs offer insight into design and production. In this utopia, forgeries are no longer kept in a dark place by the specialist philatelist 'for reference'. The Okugawa Seal, the personal seal of a Japanese official with three genuine handcarved versions (first three stamps), was a fertile breeding ground for forgeries. The stamp at far right has a philatelically forged seal. Part of the reason why stamp collecting is becoming less popular in today's generation is that philatelic methodology is sluggish in adapting to changing times. The issue of forgery is a case in point. It is an inescapable fact that forgeries are proliferating, so one should look them in the face and make something positive out of them. Does this cheapen the thrill of the 'impulse to possess', of spending one's entire life in search of an elusive (genuine) rarity to complete the set and boost the investment return of one's collection, the conventional pillars of philatelic endeavour so eloquently promulgated by Garfield (2008)? No, at least not if one is collecting for joy and knowledge, and if one cultivates oneself to eschew and transcend the materialism of the industrialized world. I argue that there are higher echelons of exploration, discovery and fulfilment that require minimal material possession. And these are accessible to all who yearn to engage in philatelic scholarship. Bristow, M. 2000. Scientific detection of philatelic forgeries. Fakes, Forgeries & Experts 3:127—130. Cohn, E. M. 2004. Relationships among art, science, and philately. Fakes, Forgeries & Experts 7:157—165. Craddock, P. 2009. Scientific Investigation of Copies, Fakes and Forgeries. Butterworth-Heinemann, Oxford. Eastwood, H. 1929. Philately under the Lamp: the Death of the Forgery. Woodstock Press, London. Garfield, S. 2008. The Error World: an Affair with Stamps. Faber and Faber, London. Kock, G. 1998. World Forgery Catalogue: a Reference List of Stamp Forgery Descriptions. Porssitieto Ky, Helsinki. Melville, F. J. 1911. Chats on Postage Stamps. Frederick A. Stokes Co., New York. Tedesco, T. M. 2014. Index of Literature in the English Language that Describes Postal Stamp Forgeries, Fakes, Reprints, Fraudulent Postal Markings and Other Obliterations. American Philatelic Research Library, Bellefonte, USA.